Let’s Use Language is an app I created to work on language in a fun and engaging way. 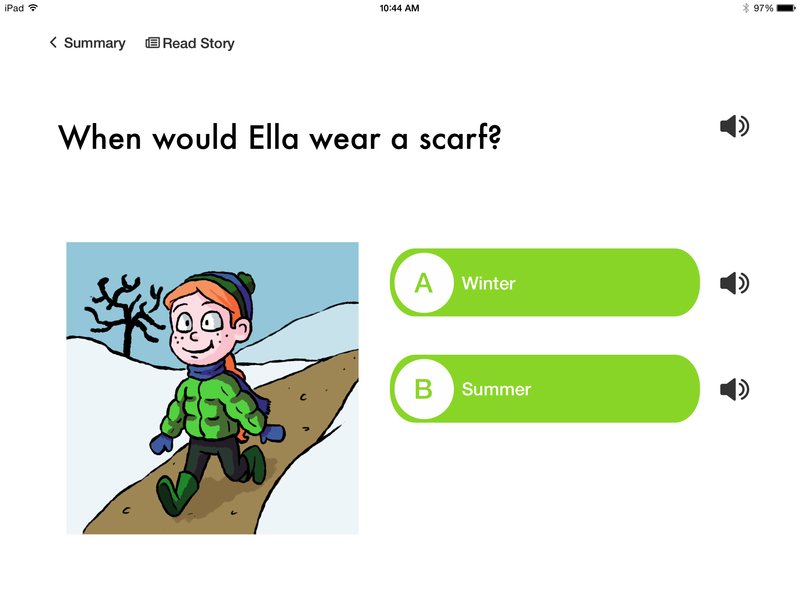 All of the lessons begin with a fun story and then reinforce concepts with multiple choice questions. 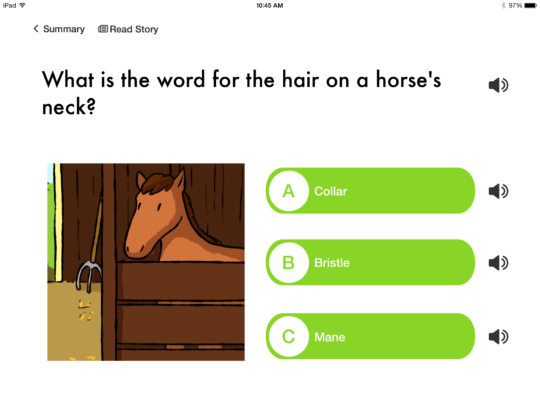 The vocabulary targeted in the app is important for students across their school curriculum and in their everyday life as well. For example, we included health vocabulary such as parts of the food groups and terms like “nutrition” because students are taught these concepts in school and at home. The lessons align with the Common Core Standards of Vocabulary Acquisition and Use and Knowledge of Language. They can be used with students from preschool to fifth grade, depending on their needs and language abilities. With over 40 lessons to choose from, we cover a wide range of language needs. We thought about important vocabulary for student’s lives in and out of school. Our stories Playing Outside, Planting Flowers, and The Life Cycle of a Caterpillar focus on words like “chrysalis”, “cocoon”, “stem”, “bud”, and “root” to give students a better understanding of nature terms. After students read Playing Outside they will have a better understanding of weather words. Science terms including nature and weather concepts will benefit students in science class. Our Visiting the Farm lesson teaches synonyms for farm animals they may not have heard before, like “hog” and “rooster”. Ella and Carly’s Day at the Beach and A Day at the Zoo help students learn about animal’s habitats and different places on our planet such as the arctic and tropical regions. In these lessons, students are asked to sequence the events of the story. The multiple choice questions ask which events came first, next, and last. This is a great way to work on answering questions based on sequential order and measure reading comprehension. You’re working on receptive and expressive language. In the settings, you can control if students see picture clues to answer the questions. Some students may not need them so you can easily turn off images by clicking on settings, then “hide question images”. This section teaches different categories of words such as seasons, food groups, types of animals, and household vocabulary. This is another chance to work on answering “Wh” and “yes/no” questions. For example the story Ella and Carly’s Day at the Beach asks questions such as “When would Carly wear sunglasses?” this is targeting the category of seasons while a student can be working on expressive language and answering “Wh” questions at the same time. If your students are working on synonyms and antonyms, the Opposites section has many different lessons teaching concepts of big, small, hot, cold, empty, full, fast, slow, up, down, living, and nonliving, and many more. Questions are asked in multiple formats including yes/no, “wh”, and conditionals such as “If it rained this morning, the field will be…”. This allows students to work on receptive language in different contexts. Check out Let’s Use Language in the App Store or part of the Complete Speech and Language Bundle here. Sign up for our mailing list here to stay updated with our latest therapy tips, app announcements, and blog posts. Don’t forget to follow us on Twitter, Pinterest, and like us on Facebook!